The Queen Mary has a long, proud history and was saved from the scrap heap by the city of Long Beach. The revelry aboard the Queen Mary includes vintage dress for special events. Keller and Cookie flank Commodore Hoard on Queen Mary. ABOARD the Queen Mary, there's always adventure. If you want to schedule it, you can, on a series of entertaining tours which take in every aspect of the grand liner's history. Or you may just let adventure find you as you dress vintage, sip a cocktail and people-watch, dine with style, stroll the decks. I EVEN PLAYED the piano on which my idol Cole Porter played during his beloved crossings. It is now the piano in Winston's, the most elegant of several eateries on board. There are tours for the history buffs, fun-seekers, ghost lovers, romantics, fans of the sea. Sir Winston's pays homage to a frequent Queen Mary guest. Manned by a crew of 500 domestic staff -- waiters, housekeepers, painters and engineers -- she has 346 hotel rooms and is truly a floating museum. To recall her glory days, vintage faucets offering the option of salt water were retained. In pre-air conditioned days, the '30s fans that now serve as decoration would have been essential. Of the Queen's crew who manned her last voyage in 1967, 200-plus survive; they visit the Queen Mary from time to time. MILLIONS worldwide have walked her decks since she moved to Long Beach, California -- including presidents, prime ministers and dozens of movie stars. "It's always wonderful to have the crew come visit," says Commodore Everette Hoard. The ship is kept very "shipshape." Among notable visits in recent years, Cunard's Princess made a stop in Long Beach to say "hello" to the Queen Mary. In 2006 – Cunard's flagship, the Queen Mary 2, met her namesake, the original RMS Queen Mary. AND IN 2011, Queen Victoria visited her older sister, the Queen Mary, before heading back to Southampton via the Panama Canal. The QE2's longtime captain, Ron Warwick, sailed into Long Beach later in 2011 aboard Cunard's Queen Elizabeth. "He got off there, to visit us," says Commodore Everette Hoard. Shops and boutiques, tours, restaurants, lounges, tea and exhibits await. And in March of 2013, a "royal rendezvous" occurred when Cunard's Queen Elizabeth visited Long Beach with a formal reception, fireworks and other grand hoopla. 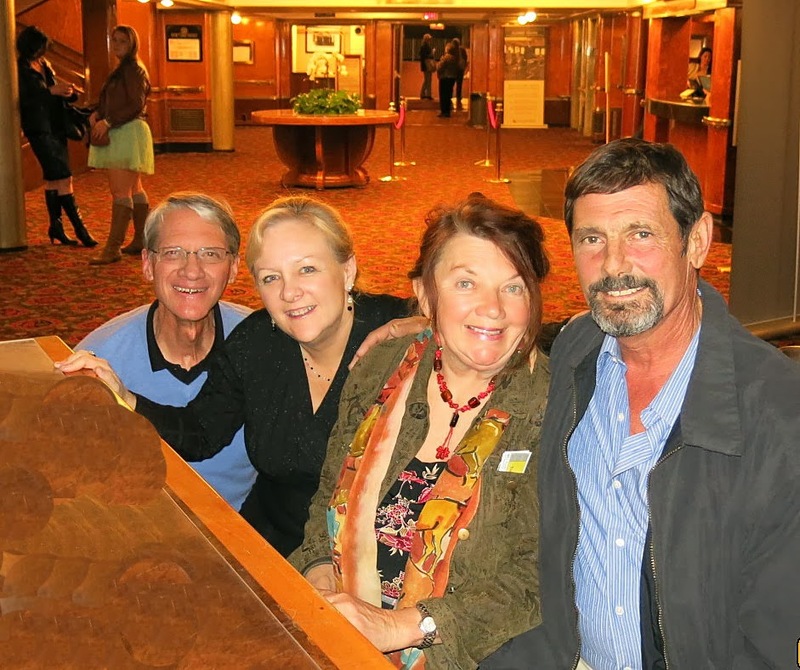 At that fun occasion, 3,800 liner-loving revelers came on board the Queen Mary to celebrate. If you want to celebrate on the Queen, you're welcome. "Special events are our bread and butter," says Commodore Hoard. He sees his job as mainly one of public relations -- since the ship is not going anywhere. BUSTLING ABOUT the ship, he schmoozes with visitors, history buffs and overnight guests, posing for photos and answering questions about the bridge, engine room or restaurants. A vintage fan nods to long ago. Guests check in at the Queen Mary's lobby reception area. Cunard's rich seafaring history, the various Queens who transited the seas under Cunard's banner, the ship's construction and contents and even the 57 varieties of wood found within her. When one guest asked the difference between a liner and a cruise ship, the Commodore had a concise and immediate answer. "Liners are built with a reserve of speed," Hoard said. "The Queen Mary, for instance, could go 28 l/2 knots. Liners have a longer, sleeker hull. And even a large cruise ship will navigate around bad weather," he says. "Liners just go for it -- plow right through the weather." view of Long Beach from Queen Mary. Hoard also lectures on board other vessels, preferring to stick with Cunard, although he's been asked recently to lecture on other lines. Told that we loved bridge tours and visits to the captain's private quarters, Hoard didn't hesitate to take us to the bridge and into his quarters. Among the famous who enjoyed cocktails there were presidents Ronald Reagan and George H.W. Bush along with "the Iron Lady," Margaret Thatcher, who shares pride in the Queen's heroic part in the Allies' winning of World War II. Nearly 60 kinds of wood adorn the Queen Mary. several Queen Mary crossings with his wife, Clementine. When Winston's was opened as the ship's top restaurant in the late 1970s. Long before GPS, these tools of navigation guided Queen Mary. were witnessing history and an end of an era, they stood and saluted. That cold September morning on the Atlantic Ocean would be the final time the two beloved ships would cross paths, before the Queen Mary was permanently docked in Long Beach where we had the good fortune to visit her! Keller aboard the grand Queen Mary. COMING UP: Renting a car abroad can be daunting, but it can also offer joys, excitement and a unique, personalized way to see the country. A few tips can help you navigate.